Durometers can be a very effective tool for selecting the best tires from a new stack as well as helping to decide when your used set needs replacement. 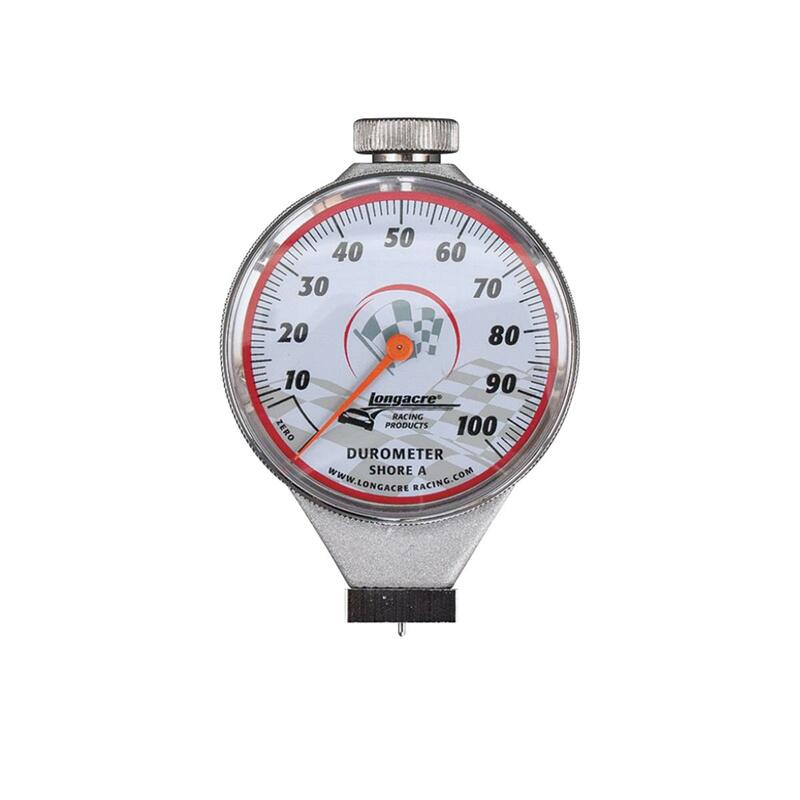 Durometers measure the relative hardness of the rubber on your racing tires. In order to get the most accurate results you need to follow a standard routine. You must apply equal pressure to the durometer each time you take a reading. 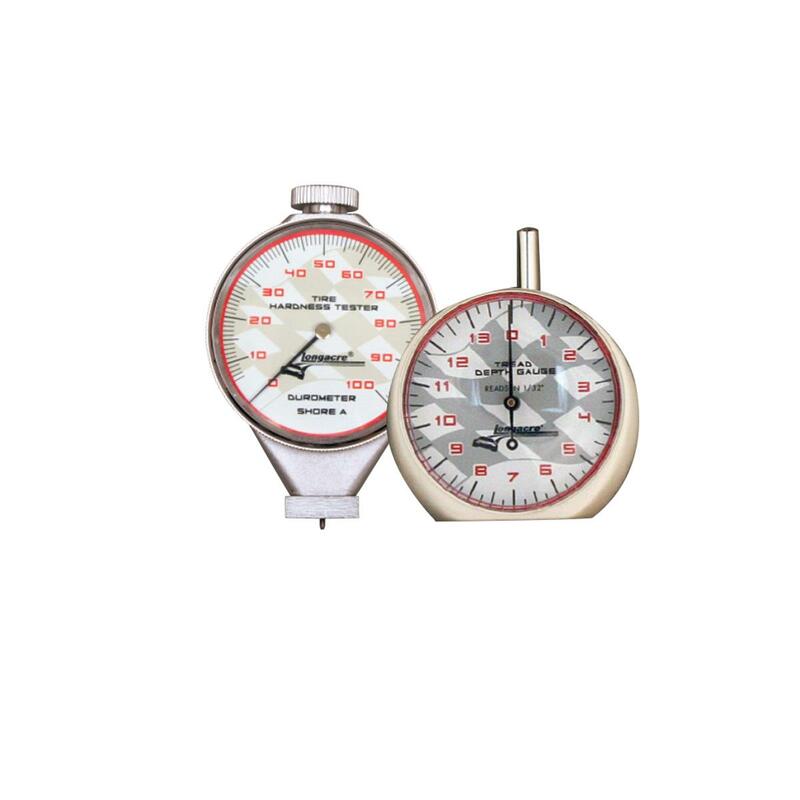 If you press the durometer down very hard one time and then very soft the next your results will vary due to the uneven hand pressure. You must also take a measurement quickly and be consistent when taking readings. 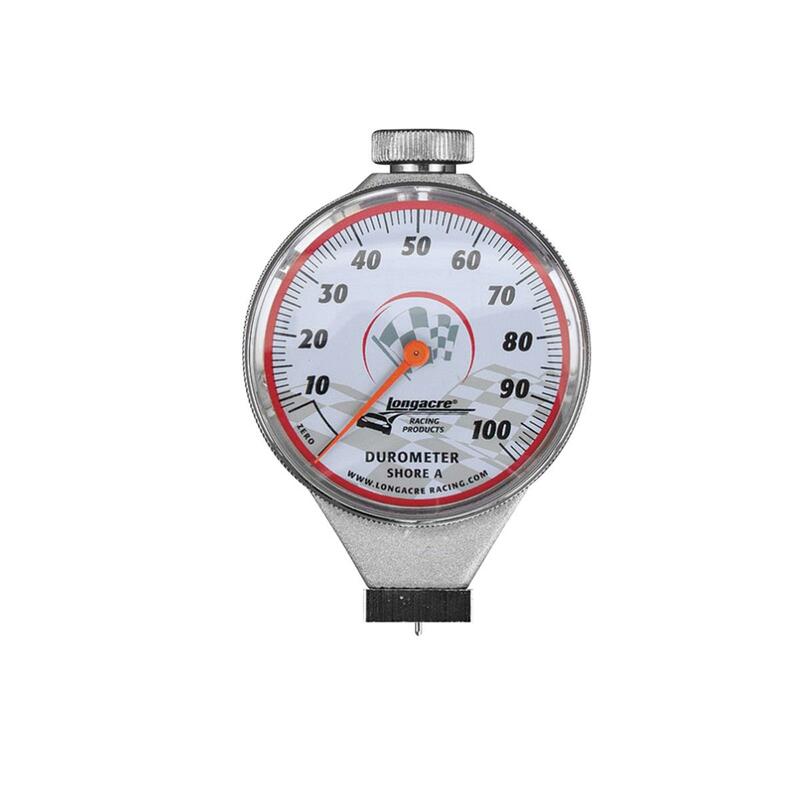 If you place the durometer on your race tire and leave it in the same spot for several seconds the rubber will deform, giving you a false reading. The rubber conforming around the durometer-testing probe will create the false reading. For the best results you should take your durometer readings as quickly as possible. 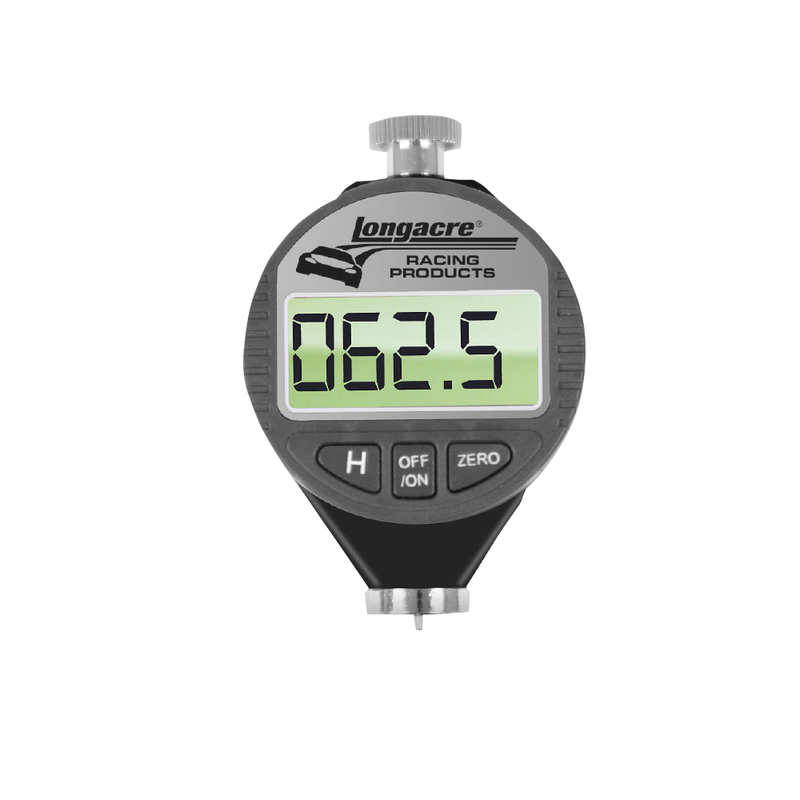 Simply place the durometer on the tire surface with the footpad at a slight angle. Lightly roll the footpad until it is flat on the tire, take your reading and record the measurement. For accurate results you must also consider the temperature of the tire. Hot tires will be softer than cool tires. If you are looking for the softest tires in a stack then you need to take care that you take durometer readings in equal environmental conditions. For example, if you take a reading on a tire that is in the hot sun your durometer reading will be softer than an equal compound tire that is in the shade. The side of a tire facing direct sunlight will generally read softer than the side facing the shade. The temperature difference results in a durometer reading difference. Temperature can affect the tires that are on your car. Tires that have heat from a hot lap session will give you a softer durometer reading than tires that have not yet been run. If you check the tires with a pyrometer you can insure that the tires are the same temperatures to insure more accurate results. On tires that have been run be sure to prep the tire surface for a proper durometer reading. You should take a small scraper and remove any loose rubber from the tire surface. Removing the loose rubber requires little effort on hot tires. Cold tires require a little elbow grease to get down to the true tire surface. When race tires are hot they are very sticky. Riding around the track on a cool down lap and driving through the pits allows the hot tires to pick up the loose bits of rubber that are lying on the track surface. The loose rubber adheres unevenly to the tire surface causing false readings. The loose rubber must be removed with a scraper to allow the durometer footpad to sit flat on the actual tire contact patch. You must remove the loose rubber to get accurate durometer results. If you are checking your tire wear with a tread depth gauge you need to remove the loose rubber as well. Remember, durometer hardness is only part of the tire equation. Tire compound, chemical composition, tire tread gauge, sidewall design, heat cycles and tire wear are all factors that affect the performance of your tires. Considering all the variables and using your durometer measurements will help you to select the right tire for the right conditions. Proper use of the durometer will allow you to track the condition of tires, giving you the chance to replace them before the tires get too hard for competition.